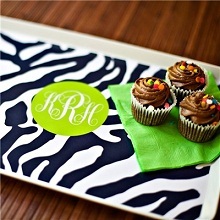 The stylish, Zebra print personalized trays from Clairebella are perfect for holding office papers, serving drinks, or organizing personal products in the bathroom. Each melamine tray measures 9 1/4″ x 14″. *All personalization is custom ordered exactly as entered below, please use upper and lower case as you would like to see on the finished piece and note that text is case sensitive according to chosen font. Available in 12 Zebra colors.